A renewed focus on pay equity at the state and federal levels, coupled with the power of movements like #MeToo and #TimesUp, have companies and their HR/compliance representatives taking a deep dive into pay practices to ensure equity for all. Recent lawsuits settled in favor of plaintiffs, and activist call-outs for companies to be more equitable and transparent about pay practices, also add fuel to the fire. That’s just the tip of the iceberg. If you’re not on top of this critical issue, you could be next on the list of companies facing legal and public scrutiny. XpertHR can help you wade through the regulatory requirements and practical considerations to audit and revise, as necessary, your pay practices. 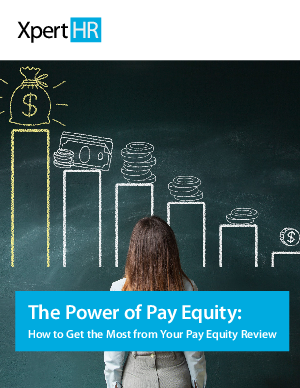 Download XpertHR’s whitepaper “ The Power of Pay Equity - How to Get the Most of Your Pay Equity Review " to learn 8 essential steps for evaluating and refining your pay practices.